In early October 1895 the Japanese forces moved against the Taiwan Republic of Liu Yung-fu based in Tainan. On 12 October 1895 three Japanese men-of-war appeared off the entrance to Takao Harbour. 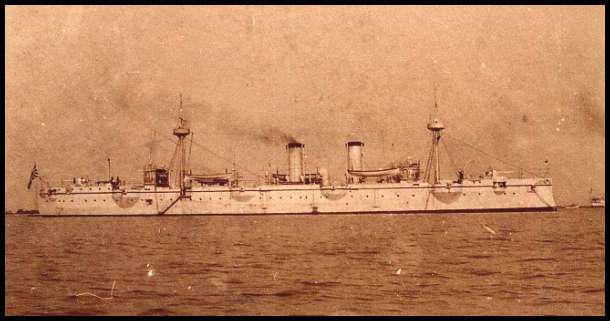 The Japanese ships included the flagship Yoshino and the intimidating iron-clad cruiser Akitsushima (see photograph below) which had just seen previous action off Port Arthur in the Sino-Japanese War. Although the Akitsushima was Japanese-built, the Yoshino was British-built. Ironically, the ship had originally been built for the Chinese Navy, but when China failed to make payment the ship was sold to the Japanese Navy. The Japanese, wary of a fierce fight, allowed Lieutenant Ward, commanding HMS Tweed, to take the remaining British residents at Takow to a safe distance offshore. 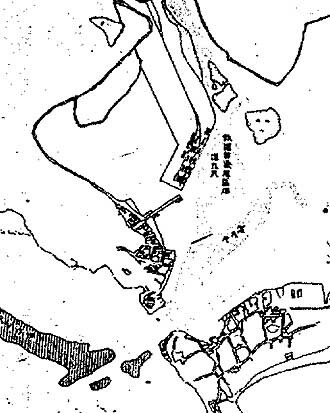 However, when the Japanese warships opened fire at 7 am on 16 October, the fort on Saracen's Head above Chi-hou offered merely token resistance, although the fort high above ShaoChuanTou on Ape's Hill (Shou-shan) seemed more threatening. Yet by 4 pm the Japanese flag was raised over the Ape's Hill fort, the Saracen's Head fort having fallen in the early afternoon. The British residents were back in their homes before sundown. The propagandist woodblock print on the right, taken from Davidson, shows just how mismatched the Japanese and Taiwanese (Chinese) forces were. Liu Yung-fu was living in a world of bluff and chivalry, but the Japanese had been catapulted out of such dreams by much earlier Western encroachments (particularly the 1863 Kagoshima Incident). While the Japanese authorities were largely welcomed by the foreign merchants and the missionaries, it gradually became clear that the Japanese plans for the development of their newly-acquired colony did not include much of a place for the Western traders and banks. Particularly after 1898, when the very able Goto Shimpei arrived on the island with almost unfettered power as the Chief of Civilian Administration, the days of ShaoChuanTou's dominance of the Taiwan sugar trade were numbered. The foreign merchants had relied upon British banks in Amoy to finance their trade, on Chinese compradores to acquire their sugar and to sell their opium, and latterly on British steamers to transport their goods. This system was to be challenged by new Japanese banks, huge new Japanese sugar mills linked by rail to new wharves, the control of opium through a monopoly, and the subsidization of Japanese steamship companies. Japanese District Office for Takao At the outset of the Japanese colonial rule the administration was military and principally focused on the quelling of partisan resistance to the new rulers. The resistance or 'banditry' was largely suppressed by 1898 when Goto came to Taiwan. 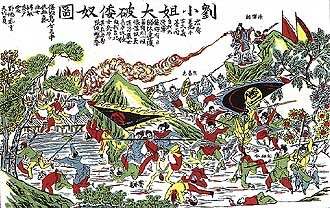 However, actual resistance in the south of Taiwan did not finish until 1902 with the death of Lin Shao-mao at the southern end of the lagoon (see The Tale of Lin Shao-mao on this site). In this early period ShaoChuanTou continued to be a focal point. 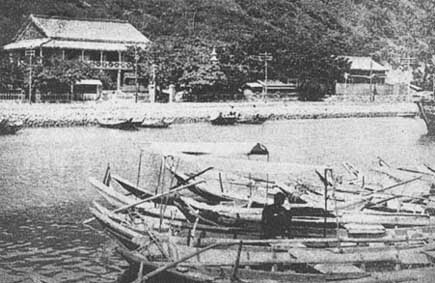 The Japanese set up a District Office just to the north of the clubhouse jetty (see photograph at left), and later the first Japanese bank in Kaohsiung was to be built adjacent to the jetty (see below). However, it should also be noted that the first 'modern' school in Kaohsiung was set up by the Japanese at Chi-hou in 1898. Thus retaining ShaoChuanTou as a commercial centre and Chi-hou as a social centre. The 1900 photograph shown on the right has some interesting features. The Takow Club can clearly be seen near the middle of the right margin as a white building. Yet behind the jetty and club can also be seen the silting and land formation that had been allowed to despoil Kaohsiung Lagoon during the late Ching Dynasty era. 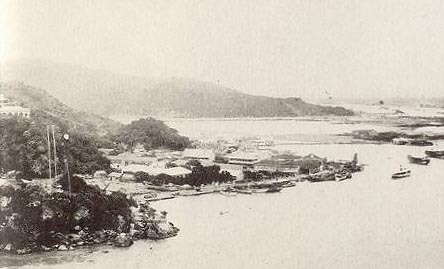 The darker roofs at the eastern extremity of the ShaoChuanTou point (middle right) are the coaling stations that were so essential to the turn-of-the-century trade that was increasingly dominated by steamers. It should also be noted that this is one of the earliest photographs that show the British Consular Residence on the hill above ShaoChuanTou. Kaohsiung's first Bank of Taiwan The Bank of Taiwan was established in July 1899, and the first branch in Kaohsiung was built a few years later. This allowed the sugar trade to be financed locally, rather than through the Amoy-based banks and thus the Amoy-based trading companies. This imposing Bank of Taiwan building stood on ShaoChuanTou Road, on the other side of Kushan Fishing Harbour from the today's Chi-chin Ferry Station. The building was apparently soon demolished or dismantled, as the next Bank of Taiwan was set up, and still stands in rebuilt form, in Lin-hai First Road, Kushan district. In the photograph on the right it can be seen that it was built next to the Chinese Godown with the swallow-tail roof, and thus on the land previously occupied by the ICMC Tide Surveyor's Office and Residence. (more can be learnt on the Map page). The railway line from Taipei down to Kushan in Kaohsiung was completed in 1908. The railroad can be seen on the 1910 map on the right emerging from the centre-top and terminating in the centre of the map portion shown. Just below the terminus is the Takow Club jetty with ShaoChuanTou to its south and Chi-hou at the bottom right. Shou-shan is at the upper left, with Ape Hill (not shown) rising above it. To the right of the railway line can be seen a river mouth. This mouth is one of the two mouths that Love River originally had. The other mouth, to the east, has remained pretty much unchanged until the present time. However the mouth shown on the map is all but invisible, yet it still exists. Its path can be traced from Chi-hsien Bridge and down between Chi-hsien Road and Lai-nan Street in Yen-cheng District, finally emerging into the No 1 Ship Channel of the harbour. The watercourse is covered over for most of its way by a market called 'Ta-kou-ting', meaning 'on top of the big ditch'. The Takao terminus stood on reclaimed land and allowed the transportation of raw materials for the development of Takao harbour which commenced in the same year. The first stage was the construction of a massive caisson from the railway terminus west towards ShaoChuanTou. This allowed for the extension of the railway along the caisson, the landfill of the so-called Hamasen district (the southernmost part of today's Kushan District of Kaohsiung), the dredging of the harbour bottom, and the construction of proper wharves for loading and unloading freighters. 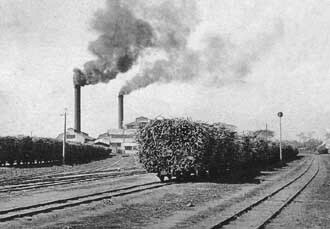 Japanese Sugar Mill at Pingtung Prior to the Japanese Occupation, the sugar industry had reached its peak in 1880, producing nearly 140 million lbs. Lack of investment within the industry and political uncertainties outside had seen the sugar output shrivel to less than 60 million lbs by 1900.(Hayase). However, demand in Japan was constantly increasing. 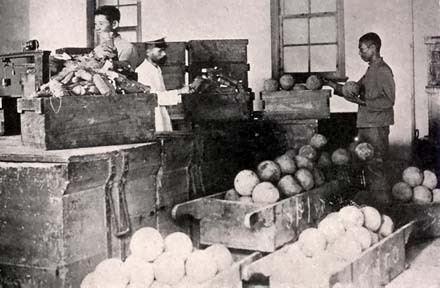 The progressive Chief of Civilian Administration (from 1898 to 1906) Goto Shimpei encouraged Japanese companies to invest in the industry, while recruiting able young officials to provide agricultural and technical expertise on sugar manufacture. With the development of the rail network and the assertion of full control over the southwestern Taiwan plains, the way was open for the construction of massive modern sugar mills and the introduction of high-yielding strains of sugarcane. By 1907 the sugar output had returned to the 1880 level, and by 1910 had reached an astonishing 465 million lbs. Perhaps the deciding blow for the foreign traders was the imposition of an Opium Monopoly by the Japanese authorities in 1897. This impelled the sugar traders to pay for their consignments in specie rather than the highly profitable opium. An opium processing factory was set up in Taipei in 1899, enabling thorough control of the sale of processed opium and generating an income amounting to a third of government revenues in the early years. (for more on this see 'The Opium Files' on this site). A final twist on this story comes from the tale of the perhaps little-known British company of Samuel & Samuel. Samuel & Samuel began as traders of exotic seashells in the East end of London. Marcus Samuel, the son of the founder, had been impressed by the possibilities of trading kerosene in eastern Asia and built up a strong market in Japan and on the China coast. Indeed, the Japanese authorities were so impressed with the professionalism of Samuel & Samuel that they were soon awarded the sole rights to purchase opium for the Taipei factory. As for the seashell business, Samuel & Samuel became later better known through their shipping arm of Shell Transport and Trading. Shipping was to be the final squeeze on the Western traders. As the Kaohsiung harbour had silted up and the old sailing ships given way to steamers with their deeper draughts, so the non-sugar trade had drifted up to Anping, the port of Tainan. In both Kaohsiung and Tainan it was necessary to load the freighters from lighters, or barges, but not only was Tainan closer to the centre of Ching power but it had no bar to pass over. Thus facilities at Takow had remained crude and in the hands of local lightermen. 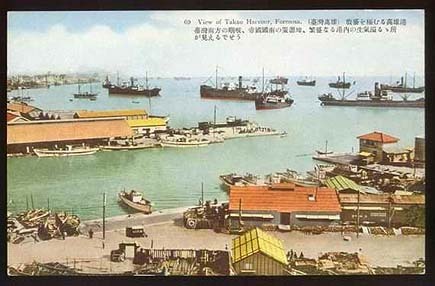 Postcard showing 'View of Takao Harbour, Formosa' When the Japanese arrived they dredged the harbour to allow steamers to enter. Moreover, to encourage trade, they initially subsidised the Japanese shipping lines who set up routes to Taiwan. This move was also undoubtedly aimed at the Douglas Steamship Company which had come to run a virtual monopoly on the shipment of goods in the south China seas. The postcard picture on the left shows Takao Harbour perhaps in the 1920s. The picture has been taken from the top of the small cone-like hill at ShaoChuanTou. The new wharf at Shin-hama (Ha-ma-shen) can be seen on the middle-left, behind the fish-market that still stands today just to the south of the Chi-chin Ferry Station. Of note is the small gateway and fenestrated wall to its right, that stands in the left foreground: this is the remnants of the old Chinese godown at ShaoChuanTou. Above all, the large number of steamers in the port is noticeable. Thus the changes that came with Japanese rule, such as in banking, production and transportation, were to spell the end of any Western trading monopoly in Taiwanese brown sugar, which, given that the major market had been Japan since the 1880s, was reasonable. The final picture (above) on this page from 1928 shows a fuller panorama from the same point as the postcard. The fish-market is marked (2), with the wide new street (Pin-hai 1st Road) dividing the wharves from the related offices marked (1). The Kushan Fishing Harbour is marked (5), while (4) is the fuel station for the ferries and other light craft. In the distance would lie Yen-cheng District and the future prosperity of Kaohsiung. It is ironic that some of the very changes for which the Western traders had clamoured to the Ching authorities, such as the dredging of the inner harbour and harbour entrance, were now arriving. Although these changes marked the beginning of Kaohsiung's modern era of prosperity, it was a future to be dominated by Japanese and Taiwanese traders.